About Minneapolis & Suburban Bus Company. Welcome to Minneapolis & Suburban Bus Company and Minnesota Coaches, Inc., provider of safe and reliable school bus and motor coach transportation for Minneapolis School District and surrounding communities. 2006 is our 10th year of providing Minneapolis & the surrounding area with Safe, Reliable, and Friendly School Bus, and Motor Coach transportation. The safety of your children or your group is our number one priority. School Bus Transportation - Minneapolis & Suburban Bus Company currently serves Minneapolis School District as well as several charter and private schools in the Twin Cities metro area. Call us for a quotation on any regularly scheduled transportation needs. To learn more about Minnesota Coaches please click: Minnesota Coaches, Inc. 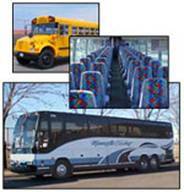 Maintenance and Repair Services - Minneapolis & Suburban Bus Company also provides licensed school bus and motor coach maintenance and repair services. Call us today and see how we can help with your maintenance needs. At Minneapolis & Suburban Bus Company and Minnesota Coaches, Inc., we're committed to hiring and retaining the highest qualified drivers and mechanics. All our employees participate in our high-quality continuous training program. If you would like to pursue a rewarding employment opportunity and you feel you have the qualities and skills to be a top-notch driver or mechanic, just Apply Online (select the Careers page) to get your rewarding employment opportunity started . Driving a school bus is a rewarding and flexible job. Join our team and play a key role in the community. No experience is necessary and we offer paid training, flexible hours, competitive pay, bonuses, benefits, and we allow you to bring your children to work. Call, e-mail or stop in and See The Difference. Copyright 2006 Minnesota Coaches, Inc. All rights reserved.